Based on comments, it seems like the switch from Marry, Date or Dump to this game has been a success. Although as my sister said this morning, “It’s way easier to dump a character than it is to burn a book.” She decided this lineup was too hard for her to choose, but I hope you will play along and say which book you would read (favorite), rewrite (like but might want to change), and burn (least favorite). These are three of my favorite favorite books – stories so nice I had to say favorite twice – but I’m going to give it a shot. Can’t wait to read your picks in the comments! This entry was posted in Marry Date or Dump and tagged books, Hemingway, The Catcher in the Rye, The Great Gatsby, The Sun Also Rises by Alison Doherty. Bookmark the permalink. Rewrite – The Sun also Rises – although the ways that I would change it would probably destroy it. I haven’t read The Sun Also Rises, so I’ll have to burn that one. 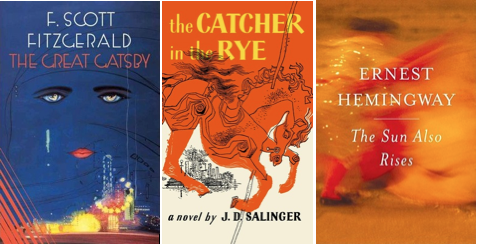 Read: The Great Gatsby (always) and Rewrite The Catcher in the Rye (small, small changes and an epilgoue, like you). Burn is such an intense word to use as a book lover! I’ll have to say read The Sun Also Rises (because I’ve been meaning to – I HATED it when I had to read it in highschool along with all the other Hemmingway I tried, but my tastes have changed significantly since then, and I can’t bring myself to just give up and dismiss it as “I guess I just don’t like Hemmingway”); rewrite The Great Gatsby (barely); and burn Catcher in the Rye (not because I didn’t like it, but because this is the one book I can live without ever rereading).